Buy Stops are placed above the current last traded price. 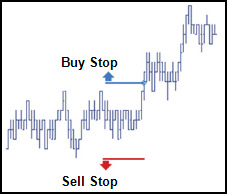 Sell Stops are placed below the current last traded price. Triggered native stops can be priced as Limit orders with a fixed price or Market orders.The Override Native checkbox found in the Advanced section of the Order Pane lets you send natively supported stop orders to the Synthetic SE instead of directly to the exchange. The following screen shots illustrate a synthetic Stop order with a trigger price of 143125 based upon the ask price. Once triggered, the Synthetic SE submits a child order to the market. The Order Pane example on the left submits a child older priced relative to the Ask price minus one tick. The example on the right submits a child order with a fixed price entered manually in the main Price field of the Order Pane. The TTStatus field displays the relative priced Stop (i.e., Ask minus one tick) in the Pending Trigger state. During this time, the Synthetic SE continuously monitors the order for the trigger condition(s). The quantity displays in the Undisclosed Quantity (Und Qty) column because it is not actually included in the exposed depth of the market. The Audit Trail window summarizes the synthetic order parameters. If the order server goes down, or the trader who originates the Stop order is not logged in when the order triggers, the order is sent to market with the Trader ID of another trader with the same Group ID. Held Stop orders do not trigger until the original trader or a trader with the same Group ID resubmits it. 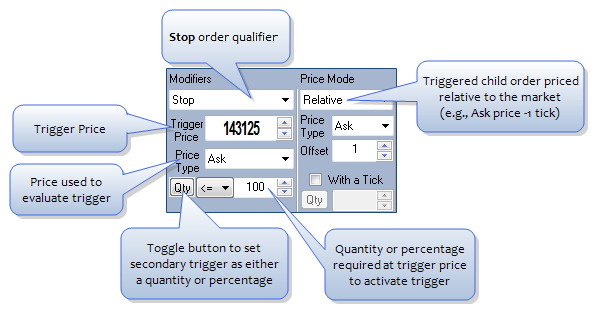 Stop orders in place for the same product at the same trigger price (for the same trader or multiple traders), process in a FIFO (first in, first out) order. Note: You can also enter Stops using MD Trader . A red a circle with a slash through it appears if you try to enter an invalid price level. Select Stop from the Modifiers list. Use the Price Mode section to set how to price the child order that will be submitted to the market when the Stop is triggered. Enable Stop Market and/or Stop Limit in the Enable Order Types section on the MD Properties | MD Trading tab. From MD Trader, select the Stop order configuration. Select the Stop configuration in the Order Type drop-down list. Configuration routing using the Routing Configuration dialog.